This band that really knows how to get your party going! 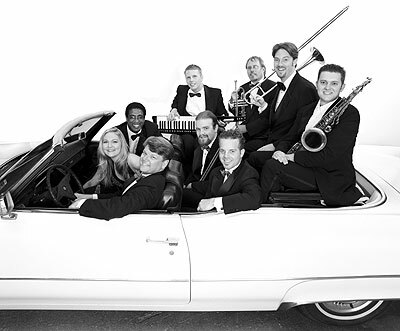 Performing rhythm and blues from the 60's, 70's, and 80's, Bullet Proof Brass will have you singing and dancing along to all your favorites. Strong lead male and female vocals and a great horn section, you had better wear your dancin' shoes to this party! "They were fabulous! Everyone at the event wanted to know more about them. The band was full of energy and wonderful to work with. I would hire them again." "Wow!! Bulletproof Brass was fantastic!! They were so personable, and what amazing voices. The main singer was outstanding and I was very pleased with the energy they brought to the reception...I just want the whole band to know how special and memorable they made our wedding day." "I couldn't let another day pass without thanking Bulletproof Brass for the wonderful job they did Sunday. The entertainment was outstanding and contributed immensely to the success of the evening. Sincere thanks to all!!!" "The best wedding band I've ever seen, period! Unbelievable!" "After a meeting with Brent, I had known that the band would be great. Their interaction with our group made their performance extra memorable. The dance floor was crowded the entire evening and are age group ranged from 2 years to 86 years! Their interaction with our group made their performance extra memorable and special for all of us. Thanks for a great evening." "Words are not enough to express how pleased I was with the music for our wedding. You made the reception a huge success. Our guests are still talking about it! Thank you for making our special day so memorable. Love, Haley." "Their performance was outstanding! We have a very diverse group and everyone was very pleased with Bulletproof Brass." "My guests were raving about the band. Many said it was the best band they had ever heard. The dance floor was still full at 1:00 AM. Many thanks." "They were terrific! What a fun band. Everyone danced and had a great time. Very easy to work with." "They were outstanding! They made the party a hit and did a first class job."